Sterling silver flat wedding rings that are completely flat on the inside, as well as outside creating a rectangular profile. 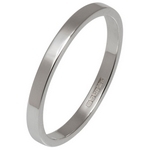 Our flat wedding rings are made from sterling silver (925) and carry a full UK hallmark inside each ring. Available in 2mm to 10mm widths there is a ring that will suit everyone. Each ring will arrive with a highly polished finish which will be completed just prior to dispatch.